Dementia changes the way people think, feel and behave. The symptoms vary but most people with dementia have problems with memory, understanding, speaking and getting on with everyday life. Dementia is most common in people over 60, but it occasionally develops before this. It gets worse over time, although how quickly varies from person to person. About 850,000 people in the UK are diagnosed with dementia, and in most people it’s caused by Alzheimer’s disease. Dementia doesn’t normally run in families, so having a parent with dementia doesn’t normally mean it is more likely to be passed on. your family or carers get support to look after you and stay well themselves. work closely with other care teams and share information so that everyone knows your needs. If you can’t understand the information you are given, tell your care team. People living with dementia can sometimes become distressed, aggressive or very agitated, and can have hallucinations or delusions. Antipsychotic medicines can help with this, but there are pros and cons to taking them. We’ve produced this patient decision aid to help healthcare professionals discuss antipsychotic medicines with people living with dementia and their families and carers, so they can decide together if these are the right choice. People living with severe dementia often have problems with eating and drinking. For some people, tube feeding may be an option until they can go back to eating and drinking normally. We’ve produced this patient decision aid to help healthcare professionals discuss tube feeding with people living with dementia and their families and carers, so they can decide if this is the right choice. 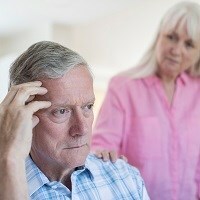 NHS Choices has more information about dementia. We wrote this guideline with people who have been affected by dementia and staff who support them. All the decisions are based on the best research available.